Every work is good as long as it is done well. K&M company was established in 1993 as a family enterprise of Krystyna and Marek Plaskowski. More than 50 people are employed in the company now. The company holds a leading position on the Polish market of paper and synthetic bags for vacuum cleaners for home as well as proffesional use. It specializes in supplying chains. It was the first to introduce a set of bags in esthetic and environment friendly box. Since 1996 K&M company has been exporting its products, gaining a stable position on the Czech, Slovak, and Hungarian markets. In 2001 a capital fusion between K&M and Papierverarbeitung Görlitz GmbH was made. From this moment bags under K&M brand, manufactured in both factories, started to appear in other European countries such as Germany, France, Greece, Italy, Belgium and Russia, too. Recently K&M Group initialized cooperation with the largest trade chain in Lithuania. K&M Group tries to improve the quality of its products and services each day. It patents its own technical inventions as well as gains various certificates and branch awards. 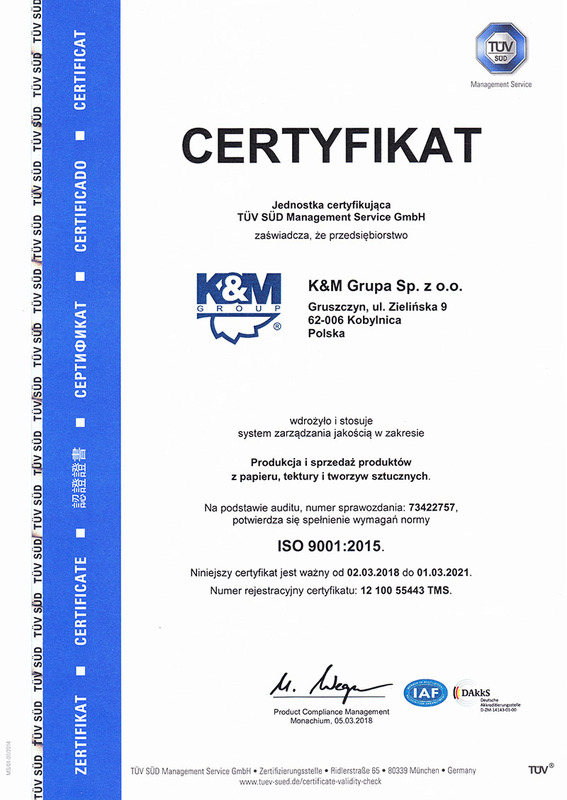 The quality managing system ISO 9001:2000 implemented in K&M guarantees high quality of all its products in every stage of production. We are not affraid of challenges, we work hard and it is difficult to discourage us. We meet our obligations with care and on time. We never fail to find a solution. We offer every bag you can think about. Long and short, wide and narrow. Bags made from a special filtering paper and a synthetic fibre, too. We will never leave any vacuum cleaner without a bag. Inventiveness of our designers' projects is far beyond from what you can simply call house dusting or paper bag production. All the employees are treated as extended family, they are partners. We do not prefer the rat racing. „Get together” at leisure solves many problems. Firma K&M Grupa Sp. z o.o. zrealizowała projekty inwestycyjne współfinansowane przez Unię Europejską ze środków Europejskiego Funduszu Rozwoju Regionalnego. Zwiększenie konkurencyjności firmy poprzez zakup linii produkcyjnej worków do odkurzaczy na podstawie umowy nr SPOWKP/2.3/30/0636.